The fight over c-sections continues, this time INSIDE the labor room. Imagine this. You’re in active labor, and things aren’t going well. Your doctors are deciding what action will be taken. One is ready to perform a c-section. The other disagrees. And while you are contracting and ready to get the whole thing over with already, the doctors start throwing blows at each other. This is exactly what took place in Italy earlier this week, and the result was devastating. 30 year old Laura Salpietro had to have her uterus removed after a fight between her doctors delayed the contested c-section she ended up needing to have by over an hour. And her son Antonio is suffering from heart damage and possible brain damage. Her parting prize? An apology from the Health Minister over her botched delivery. As if that will give Laura a healthy son and a chance to have more children. The delivery room fight brings to light the constant battle over c-sections – particularly elective c-sections (presently on the projected state-funded ban list in Utah, along with elective epidurals). Any kind of surgery doesn’t come without risk, and c-sections are no different. A woman who elects to have a c-section is at risk for severe bleeding, future fertility and pregnancy complications, severe post op pain, and an increased chance of fetal or newborn death, among other dangers. And yet the rate of c-sections is growing steadily despite the dangers involved (researchers have found that nearly one-third of first time births are by c-section – a trend that has risen 50% since 10 years ago). But c-sections do have their benefits. For a smaller boned woman, a large baby can be impossible to deliver safely. Same with babies who refuse to turn. And I can’t help but think of my cousin as a baby whose hips are permanently affected by an attempted v-birth that went horribly wrong and resulted in an emergency c-section that saved both her and my aunt’s lives. And then there was me. I have had two c-sections – the first because my daughter was almost 10 pounds, the second because my son refused to budge after 42 weeks and it’s too dangerous to induce in a VBAC. In the past, VBACs (vag birth after cesarean) were also forbidden by doctors for fear of the uterus rupturing. That danger still exists, but has been diminished thanks to modern medicine that has changed the way doctors perform the incision. 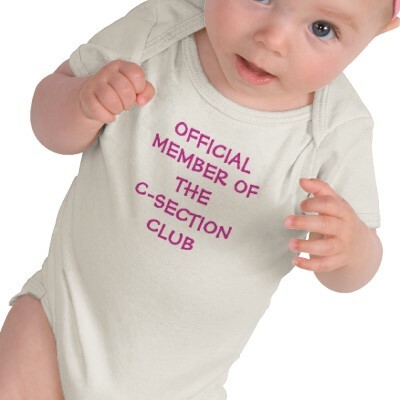 Today, most mothers can safely give birth after a previous c-section. Laura’s case is causing Italy to question the intermingling of private doctors in the delivery room. It also raises the importance of a very clear birth plan that covers all bases – including what should happen if things go wrong. And it makes me wonder if they had just made a decision – whether it be c-section or not, how would Laura and Antonio have fared?